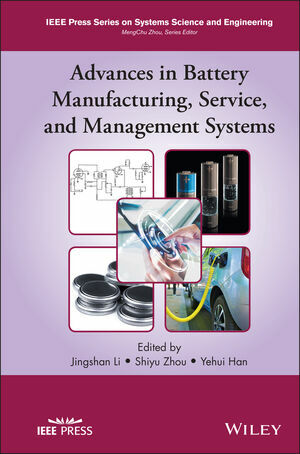 Advances in Battery Manufacturing, Services, and Management Systems is written for researchers and engineers working on battery manufacturing, service, operations, logistics, and management. It can also serve as a reference for senior undergraduate and graduate students interested in BM2S2. Jingshan Li is a Professor in the Department of Industrial and Systems Engineering at the University of Wisconsin-Madison, USA. He received his PhD in Electrical Engineering - Systems at the University of Michigan, USA. Shiyu Zhou is a Professor in the Department of Industrial and Systems Engineering at the University of Wisconsin-Madison, USA. He received his PhD in Mechanical Engineering at the University of Michigan, USA. Yehui Han is an Assistant Professor in the Department of Electrical and Computer Engineering at the University of Wisconsin-Madison, USA. He received his PhD in Electrical Engineering at the Massachusetts Institute of Technology, USA.